A capturing race is a mutual capturing contest: The first player to put the opponent into atari and then capture their stones wins the race. Usually the winner of the race (the player who makes the capture) makes life for their group. Both groups in the race are enclosed, have at most one eye and are reducing each other's liberties. The range of possible outcomes in a capturing race is extensive: besides victory in the form of capture for one or the other side, it could result in seki, a direct ko and most types of indirect ko. While a basic concept, playing capturing races correctly can be a challenge. In more complicated cases, one may apply techniques to increase his or her liberties or to decrease his or her opponent's liberties, making an accurate count of liberties more difficult. As capturing races can involve large groups, it is not unusual for a capturing race to decide the result of a game. Capturing race, five liberties to five liberties. Whoever plays first wins this capturing race. 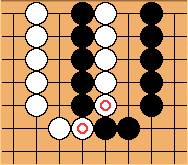 In this simple race, white is cut (see the marked stones?) and black is also cut. Each group has five liberties. Here, the first player to play in this area can win the race. There are several standard types of capturing races and it is useful to know them. There can be inside liberties, outside liberties or eye liberties. When attacking your opponent's group, playing the inside liberties last is usually correct but there can be exceptions like having to fill all inside liberties before filling the last opposing eye liberty. Otherwise and if the inside liberties are shared, in taking away one of your opponent's liberties, you also take away one of your own, and give up sente. To count the outside liberties, include approach moves: sometimes it is necessary to play more than just on the actual liberties to capture the group. Capturing Races 1 by Robert Jasiek.